Diamine Golden Ivy Shimmering Fountain Pen Ink is one of 40 shimmering ink colors produced by the prolific Diamine Ink Company. Shimmering inks exploded on the market with a multitude of ink manufacturers getting into the mix. Although there are many brands that now produce a shimmering or glitter ink, no one has as many color options as Diamine. They have produced a multitude of colors with both silver and golden shimmer. Shimmering inks, although not for everyone have become more than a trend and are not going away. any time soon They are perfect for may uses, projects, notes and letters which require a little special color added to the written word. Diamine inks, in general, are well regarded for their quality, price and color variety and are made in the UK. Since we are writing this review on Saint Patrick’s Day, we had to review Diamine Golden Ivy ink! Diamine Golden Ivy ink is a nice shade of clover green with Leprechaun gold mixed throughout, perfect color for today’s review. The ink has great shading from dark green to a lighter shade. The golden shimmer comes out with normal use. Continuing reading for a chance to win the bottle of Diamine Golden Ivy ink we used for this review. For our review of Diamine Golden Ivy ink, we used a French-made J. Herbin glass dip pen on Rhodia dot pad paper. The glass dip pen has a tip that is similar to a medium-fine fountain pen nib. We love the Diamine’s bottles for their standard inks as well as the Diamine 150th anniversary ink bottle. Both come with a medium sized ribbed lid for easy opening and unique shapes. Unfortunately, the Diamine Shimmering ink-bottles are generic cylindrical glass bottles with a small smooth lid. However, this is about the only characteristic we do not love about Diamine Golden Ivy ink. The size is a generous 50 ml. of shimmering ink and the bottle makes it easy to shake and mix the golden shimmer in the ink. Diamine Shimmering inks retail in the US for $20.00, but of course, we have it on sale. This makes Diamine shimmering fountain pen inks one of the cheaper shimmering inks on the market. Diamine Golden Ivy ink is a medium to heavy saturation ink with a longer dry time of approximately 15 seconds. The dry time will depend on the nib or tip used. Since shimmering ink has small flecks or particles within the ink, it is suggested to use a larger capacity nib to help prevent clogging. We also suggest regular cleaning of the pen and do not recommend leaving the ink in the pen for extended periods. During normal use, we did not experience any bleeding while testing Diamine Golden Ivy ink. However, during our cotton swab test, we did find a small amount of bleed through, but only at the wettest part of the cotton swab test. During normal use, we did not experience any feathering with Diamine Golden Ivy ink on Rhodia dot pad paper using a glass dip pen. However, other nibs and papers may produce different results. 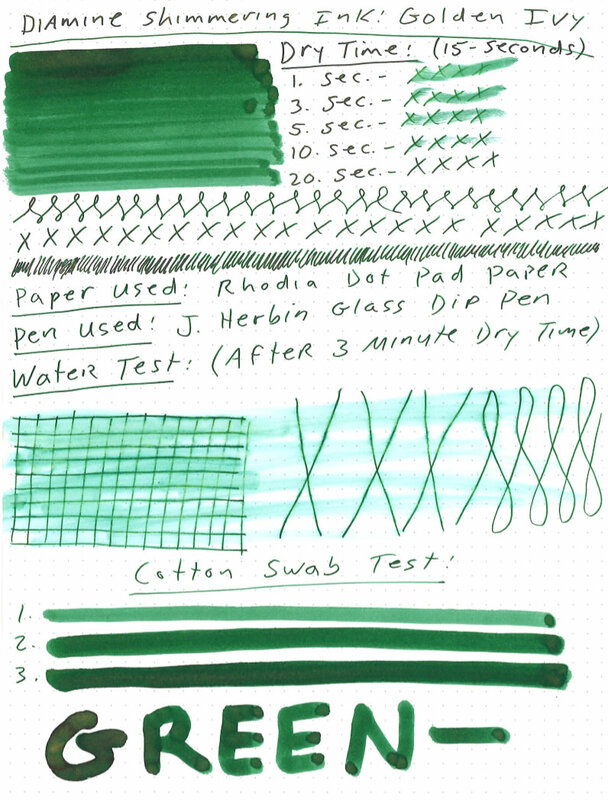 During our review of Diamine Golden Ivy ink, we conducted a water test where we ran a wet cotton swab over an ink sample that had dried for about 3 minutes. Our results were typical for a non-waterproof ink: significant color smearing, but not too much feathering and the lines remained legible. Although Diamine Golden Ivy ink is meant to be a shimmering ink, it will produce nice shading as well. The dark green wet lines contrast very well with a dusty muted lighter green shade with a dryer ink line. As with most shading, the writer’s technique and nib used will result in varying amounts of shading. Infused with the “leprechaun” gold shimmer, makes the color really pop and stand out. 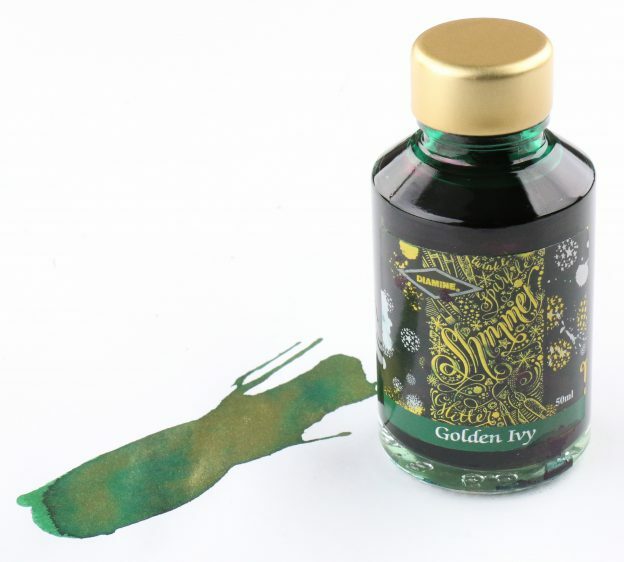 As we have previously stated, shimmering inks are not for everyone, but if you like and use shimmering inks, Diamine Golden Ivy ink is a wonderful green color with a golden shimmer that really stands out. The price is reasonable, the quantity generous and with Diamine you know you are getting a good quality ink. As with any medium to high saturation ink that is shimmering or high sheening ink, we recommend that you clean your pen periodically every week or so in order to avoid unwanted clogging of your nib and feed. A good cleaning solution, such as Pen Chalet’s Fountain Pen Flush is suggested for this periodic cleaning process. Our review of Diamine Golden Ivy ink has been the perfect way for us to celebrate Saint Patrick’s Day this year with you. Happy Writing from the Ireland and the UK! What a lovely colour! God Bless & the Love of Christ to you all!! This is just beautiful. Thank you for the chance. I’d like to see the Taccia inks. I am more and more relying on Diamine inks for their excellent range of colours and their easy flow. I would love to add this to my ink rotation! More shimmers for the family home ink box. I really am interested in shimmer inks and would love it if you could review one in purple. Diamine always has a solid shimmer. I’d love to see Diamine Shimmertastic Razzmatazz reviewed. I currently have eight bottles of Diamine Shimmers (including Golden Ivy) and a few more colors as samples, six of which are currently in Platinum Preppy fountain pens with fine nibs. Even after being stored upright and unused for about 5-6 weeks they flowed immediately after a brisk rolling to blend the shimmer back into the ink. (Much credit goes to the Preppy pens; they have an excellent cap seal.) Even a fine line shows shimmer, although the thicker the line, the more effect you get. (I have Night Sky in a stub nib–wow.) Paper also makes a difference as to how much shimmer is visible, as does the light in which you view the ink on paper. On some papers the shimmer will rub off onto your finger if you brush over dried ink. I’ll likely end up with a bottle or two of the samples colors–the shimmer is fun and the ink colors are rich. I really like the Green with Gold! I really like the Green with the Gold shimmer! I dont have any shimmering inks until now, but this looks just gorgeous. As always, I’d like you to concentrate on inks by some of the old established companies like Waterman, Sheaffer and Parker. Thanks. Diamine inks are awesome. Would you please review Taccia inks? I have never used shimmer inks but got to see them in some of the letters I received as a part of InCoWriMo. All of them were used in broad/stub nibs and looked really pretty. I would love to add this one to my collection! I am new to fountain pen life and am just discovering shimmering inks. Another commenter asked for a purple shimmer review…I would like that too, but this green/gold is very intriguing for now! I have not tried the Diamine shimmering inks yet, but they look gorgeous! I’m waiting for a bottle of Shimmering Sands. I haven’t tried a shimmering ink before but it looks beautiful. The color is lovely. I really like the shimmer. This is one of my favorite inks! I have a great pic of a poem I transcribed in it with my quill. I wish I could share it here. I love Diamine Shimmertastic inks and I have several. But this one has been on my wish list for a while now. And it looks beautiful! I love Diamine Shimmertastic inks, and I have several. This one has been on my wish list for a while now, and it’s really lovely!